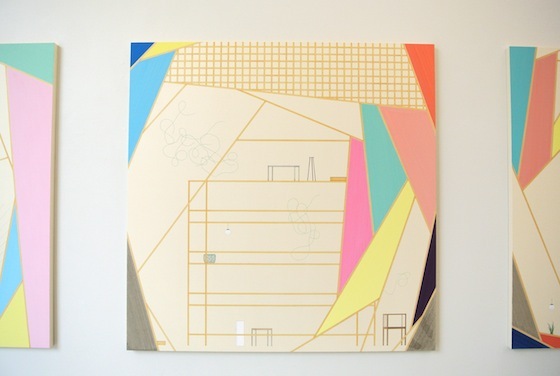 Kondo is a young painter who uses traditional Japanese techniques and restructures it with modern motifs. 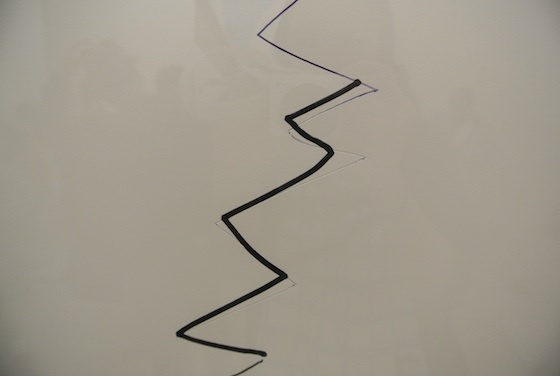 On the other hand, Hirayama draws intuitional lines with a black marker pen on paper. 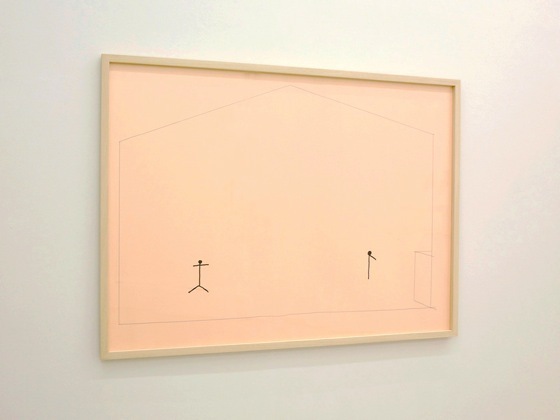 His drawings are in between objects and icons. 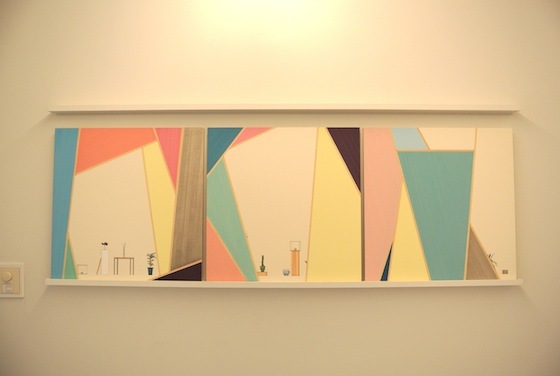 Their styles are totally different but exhibited in one gallery space under the exhibition titled “Wood board, Paper & Mobile phones” at MA2 Gallery. -May I first ask how this exhibition was planned? 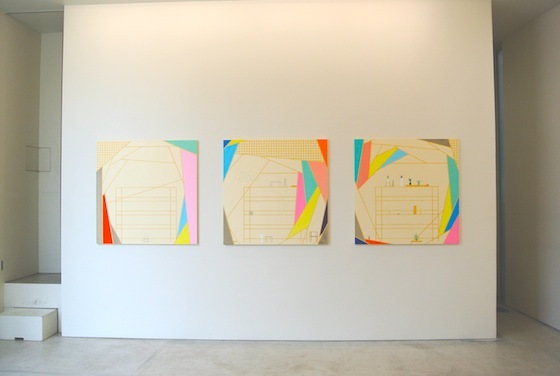 Kondo: This exhibition was planed by MA2 gallery. I knew Mr. Hirayama’s work but haven’t met him before. And when this exhibition was planed, we weren’t allowed to meet until the first day of the exhibition. Hirayama: I knew Mr. Kondo’s work too, but not in person as he said. 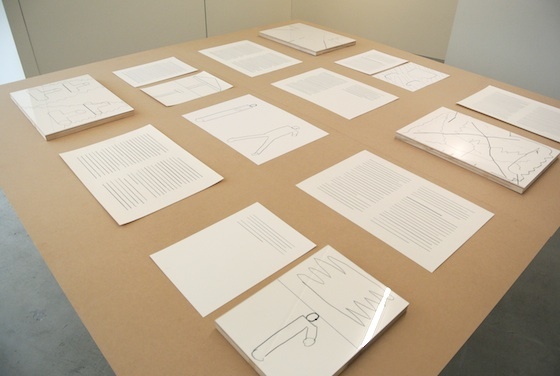 The exhibition title “Board, Paper & Mobile phone” and the work size, were the only given information. -Kondo, your work has an interesting composition. Can you tell us about your work? 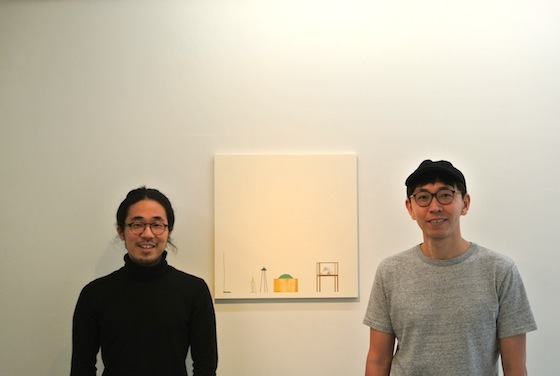 Kondo: I refer to traditional Yamato-e paintings to create my work. In Yamato-e, there are several elements to structure one painting and I am trying to replace those elements to develop it into a new expression. For example in Yamato-e, several different timelines are placed simultaneously in one painting. And because of that, there are schemes to keep your eyes moving in one specific direction. Elements like clouds, fogs and mountains are used to lead the viewer’s eye so that they can follow the timeline easily. I am interested in that structure. I inherited those traditional techniques, and reconstructed it with new motifs, such as timbers, thread and knitting wool. -As I get closer, I am surprised to see how meticulously each motif was drawn. Kondo: These timber frames are drawn by referring to the traditional the Heian period (9th-13th Century) technique of Fukinuki-yatai (meaning blown off roof) in . It is a technique in which the painting is drawn from above at a 45 degrees perspective and the most distinctive feature is that the houses are drawn without walls or roofs. They express the house only with its structures but surprisingly, we can recognize it as a usual house. It is because the structure of the image is precisely constructed with timber frames. Scene from The Tale of Genji (12th century). It was drawn in Fukinuki-yatai style which has no walls but only timber frames. 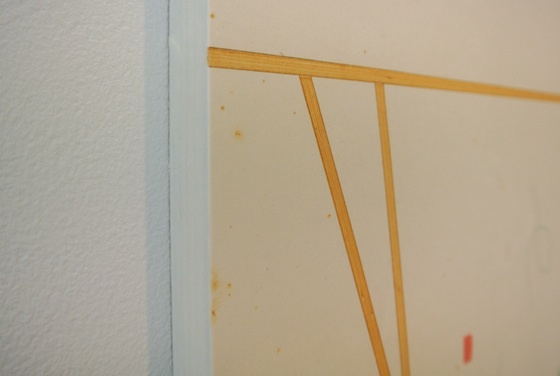 Detail of the work “wood, paper” by Keisuke Kondo. The border of colors are carefully left uncolored. -Another interesting thing is that the border part is carefully uncolored or unpainted. Why is that? Kondo: I’m often asked and I’m curious why people often notice about that part (laughs). Anyway, I am imagining a Sho-ji paper or a Fusuma door (Both are Japanese traditional doors whose surfaces are made with strong papers). Seeing my painting from a few steps apart, I try to make that part similar to that same paper’s texture. If I place no space in-between them, the border gets blurry and brighter than the other part. Because of that, I thought it is important to leave the border uncolored. 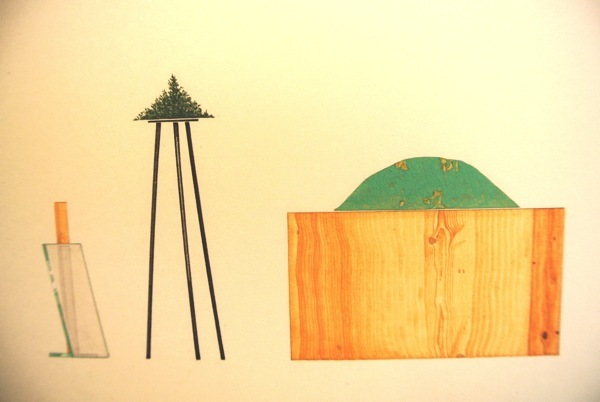 Hirayama: How about the plants and objects? It seems there is also a rule. Kindo: Right. I draw objects on canvas 1 cm high above the bottom edge. It is a kind of an anxious moment to face a brand new canvas. I started to draw objects as one part of my training. When I draw an object I recognize my emotions or skills. It is like setting up physical fitness. These objects became my milestones to see how I am doing. 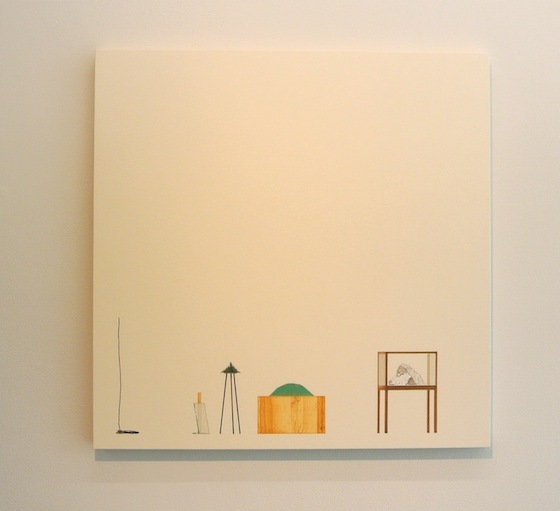 Kondo: I draw the objects in the same position. Also, I try new things on this small size painting and then try it on the larger size. I pull in any inspirations into my work. I draw smears to see how it works, then finally I put all of those techniques into my large painting. Detail of Keisuke Kondo “Me and the present situation(Board,Paper and mobile phone)”. Surprisingly, smears are solo drawn by hand! -To draw motifs, do you see photos or actual objects? Kondo: I am drawing it by seeing it in real life. I use a traditional technique, Tsukuri-e to express it. So it is like it was drawn in the Heian period (12th century). In Tsukuri-e technique, you start with drawing with a black ink, paint the base color, color the motifs and draw the lines again on top. So if you have knowledge of this technique, you can see how the object was drawn just by seeing it. Detail of Keisuke Kondo “From, Me and the present situation”. Texture of each motif is precisely drawn. Keisuke Kondo “From, Me and the present situation”. Three out of four works set were lined. -How is it different from the Western painting? Kondo: There are different in many ways but, first of all the material is obviously different. Because of that, while colors can be erased or added easily in the Western painting, it is difficult for Tsukuri-e technique. Basically, it is impossible to remove the color in Japanese traditional paintings, you have to add colors little by little and decide when to stop. Yukihiko Yasuda is one of my favorite Nihon-ga (Japanese traditional painting) artist who lived in the Meiji and Showa period (20th century). Recently, I had a chance to see his work. He copied a work from the Tenpyo period (8th century). I really like it. 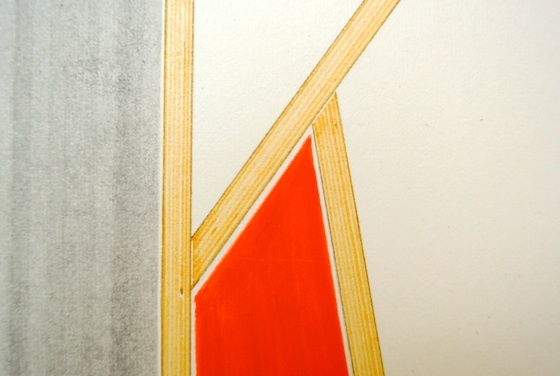 When I saw the work, I could recognize how he had drawn the lines and colored it. I cannot stop looking at it. I imagined what he must have thought when he chose the color at the moment and how much time he have used to draw it. 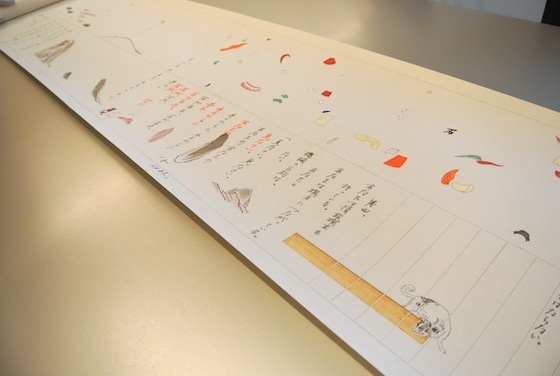 It is a unique point of Nihon-ga that you can communicate with the artist through a work by sharing the same technique. -It is an impressive story that a young artist is communicating with an old master through his painting. It must be a privilege of the artist. Kondo: I believe anyone can do it! If you learn a little about the technique, it is not that difficult. It is because the method is quite simple. Nihon-ga’s structure must be easier to understand than the Western painting’s. 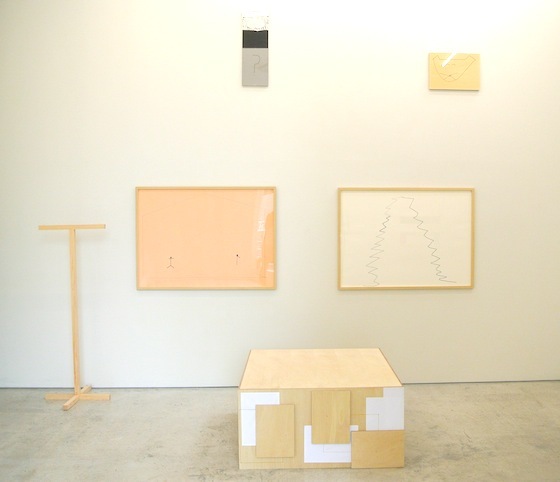 Masanao Hirayama’s works in the exhibition. This doesn’t include the large box which was used for a Raku-go (traditional funny story telling) event which began right after our interview. -Compared to Mr. Kondo’s, Mr. Hirayama’s work looks very intuitive. How did you create these works? Hirayama: I got a cat one month ago, and it completely changed my life. My cat had a big influence on me. It senses when I get distracted from working, and it walks away. That is why there are many drawings related to cats. I had a performance to become a ghost and waved a rope which is just like a cat playing with a foxtail. I tried to see how a human would behave with it. Kondo: I was at the performance. The rope waved unexpectedly but not completely out of order, it keeps some rules at the same time. It was really fun to see how the rope wiggles. Not only for a cat but it was attractive enough to allure us, human being. Masanao Hirayama “Ghost”, performance at MA2 Gallery. 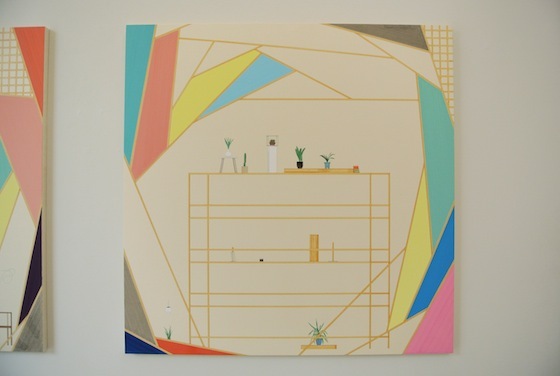 -Is this drawing (above) of a house? Hirayama: It may look like that. I’m not drawing some specific things related to me or someone else. I am not thinking about it at all. So when I am asked “what is it?”, there is no way to answer it in words. I didn’t draw this work with specific intention. I draw a lot but not in details. By drawing a lot, I could recognize the most comfortable amount of line or structure for one drawing. The amount of drawings leads me to discern what is right. I first draw on copy paper to decide the approximate shape and then move to the artwork paper and draw several times again. In the end, I choose one from the several works. But what I chose differs everyday. I chose one drawing one day but feel the other drawing is more interesting after a few days later. Kondo: I could see from his brushstroke that he was drawing really fast. For example, the pen was out of ink at this point (below) and I guess you took another pen from here to continue to draw. 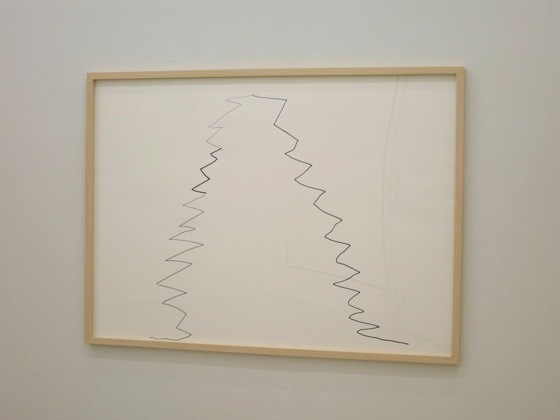 Hirayama: There is no redo in my work. 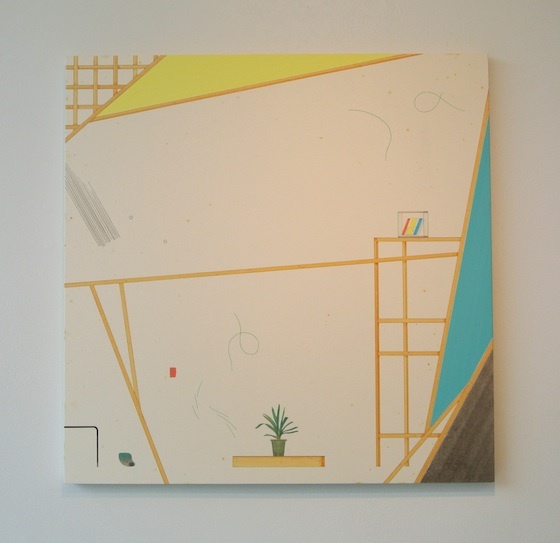 That part is similar with Kondo’s work. Kondo: Yes, that is why I got interested in your pen’s pressure left on your drawings. I imagined the process of your drawing. “Maybe he felt , oops! when the pen got out of ink and quickly changed it.” Trails of the process are always left on a work. I am interested in that. Hirayama: I put tape on the paper and ripped it off to erase it. I used to use erasers but as far as it is erased, it is the same. Kondo: In Nihon-ga, we put a piece of paper on the part to redo it. However, viewers can still recognize the extra layer of paper which means there was a mistake. Detail of Masanao Hirayama “4661” Kondo pointed that he can see how Hirayama had quickly switched his pen at this part. - How about the cat face? Had you drawn a lot of them before you chose this work (above)? Hirayama: Yes, I chose the one which is like anybody can draw. Recently, I am trying to get out of my own style of lines. I don’t know why, maybe I get bored. Anyway, I am interested in the lines which anyone can draw. -Why do you try to eliminate your style? Hirayama: If I could draw like someone else, that would be perfect. If I try to achieve something, it ends up with what I have imagined and that is somewhat boring. When I draw it over and over, then I get bored and lack of a fresh mind. I stop drawing at that moment and look it back a while later. I try to choose a work which is out of my control. Kondon: I think it takes a lot of courage! When you put in a lot of time to draw. The time itself becomes a part of the work, it gives satisfaction and confidence. But your work is done just in a second. It is a great courage to exhibit that work. Hirayama: Oh, viewers may recognize it like that. But for me, since I have drawn a lot beside the exhibited ones, I don’t feel any anxiety. Kondo: If he is completely unconscious, lines cannot be this controlled. I think he is well planned. Hirayama: I am not thinking deeply to decide how to exhibit my work but since I have been trained to draw lines from my architect background. I might be using those skills unconsciously. Usually, people see what the motif is or what is drawn in detail. But, in my work, if you can get an impression of the entire work and that is enough. Any of my work could be an icon. If someone recognized a work as a question mark, that is a question mark for that person. 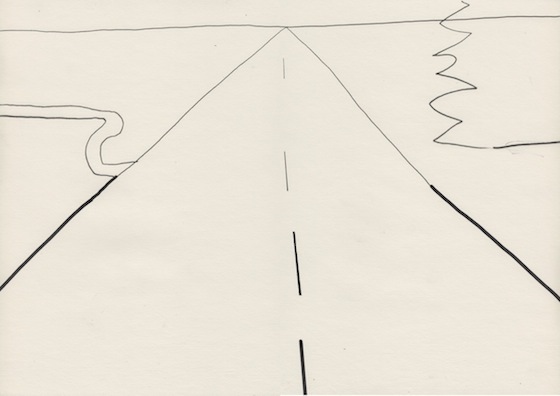 -This work (above) looks like a street to me. Hirayama: I use google street view for my training which is similar to Mr. Kondon’s sketching. Instead of starting to draw by using nothing, I see google street view as a tool. I drop off a pointer on google maps and then enlarge it until I can see the street view. This (above) is a street view in Mexico. I get inspiration from this process too. -How do you input and output the view through your brain? Hirayama: It is really like training. I made rules for myself such as just viewing the picture for 10 seconds and drawing it on a paper in a minute. I enjoy doing it. Kondo: I heard that you number every drawing. Hirayama: I am an organized person unexpectedly (laughs). I basically number every drawing and scan it in my computer. I check where I’ve exhibited which work. And the number itself is the title. -How many drawing have you done? Hirayama: Total 4000 to 5000. I started to number my drawings ten years ago. -Wow, that is a lot! Thank you. “覆絵東方恐怖譚 (fukue touhou kyoufutan)” by Keisuke Kondo and Hideo Furukawa (novelist). 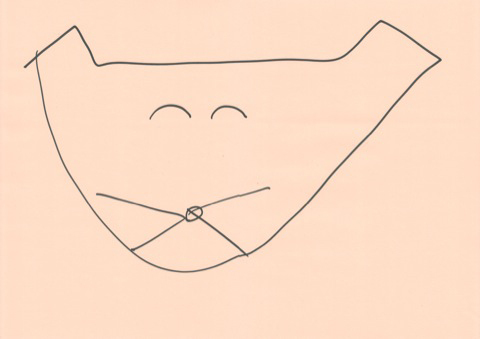 Referring the “Inga-kyo” drawing in Tenpyo period. “Inga-kyo” had upper side with images and down side with words. It was a story about the Buddha’s real life and his previous life. They used the same format. Interviewed on April 6, 201 by Rasa Tsuda.